A project inspired by fiddle muff comforters was awarded second place in this year’s Designing for the Future at the University of Brighton. 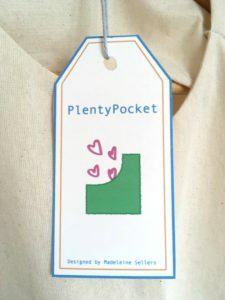 Madeleine Sellers who is studying for a BA in Textiles designed the Plenty Pocket which is a light weight waistcoat with a number of zips to attach several pockets containing a variety of comforting and familiar objects. Madeleine explains : Designing this product for people with dementia has been a massive learning curve for me. Not only have I learnt about dementia and its effects, it has opened my eyes to inclusive design. Before this project I had not considered how, as a textile designer I could utilise my skills to benefit and help individuals and society. To begin my project I started by collecting lots of research and data regarding dementia by looking at journal articles, web articles and books. I soon found that dementia is a extremely large topic that has lots of information written about it and endless articles about different peoples’ experience with the disease. In order to focus my research I decided to pick out what I found most interesting and what I could use my skills as a textile designer to create a successful product. I decided to focus on improving the person with dementia’s quality of life seeing as currently there is no cure, so I wanted to help make this stage of their lives as comfortable as possible. Being a textile designer I also wanted to focus on creating something tactile, sensory and nice to look at. I did more focused research into clothing, colour and reminiscence and by looking at products already on the market, I could deduct what was successful about them and how I could develop these ideas into my own product. The design process of my product was long and there were many issues and obstacles that I had to overcome. Initially I wanted to create pockets that attached to an already existing garment, belonging to the person with dementia. However, finding an appropriate way to attach the pockets was difficult. So, I concluded that the pockets would have to be attached to a piece of clothing which could then be worn by the person with dementia. I deliberated on what this would be, looking at the possibility of a scarf, but deciding that this may be too invasive and too hot in the summer. I finally came to the conclusion of a waist coat – but with minimal material, so it was light and easy to get on and off. 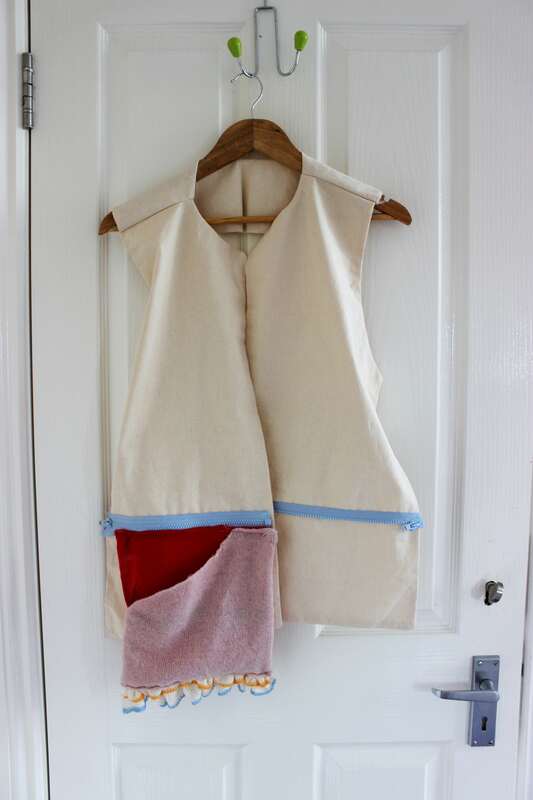 This waist coat would have zips on it to attach different pockets, inside these pockets would be velcro to attach another small pocket which would contain objects to fiddle with and an optional scent. This could be done by the carer or the family, if they had old objects that they knew would comfort the person with dementia. I also hope that this process would encourage younger people today to start thinking about collecting objects that would comfort them in later stages of their lives. However, if the person with dementia does not have any objects, a standard inner pocket with a theme would be available to purchase – for example ‘Woodland Walk’ – which would contain a pine scent and pine cones to fiddle with. All pockets would be knitted out of merino wool, which is known for being very soft, retaining heat and having natural anti-bacterial properties.